Large American tech firms and China have often found themselves at odds in recent years. The most prominent example of bad blood between a U.S. tech company and China was Google’s decision to completely withdraw from China 2010, which was spurred by its reluctance to comply with Chinese censorship laws. Facebook and Twitter continue to sit on the wrong side of the Great Firewall, along with hundreds of others. Apple, U.S. tech’s goliath with a market capitalization of over US$400 billion, hasn’t quite let the Chinese government get in the way of its business. In fact, this year has seen the company embrace China like few other firms. The difference between Apple’s embrace of China while the other firms spurning it might have to do with the products they’re selling. Whereas Apple is primarily in the business of hardware, companies like Facebook and Google are largely selling information. This difference is worth appreciating, and indeed, you’d be hard-pressed to manufacture electronic hardware anywhere in the world without at least part of your supply-chain being located in China. The world is quite familiar with Apple's use of Foxconn to manufacture many of its products, and while it has recently shifted part of its manufacturing back into the U.S. for the new Mac Pro, this is largely just for show. Earlier this week Apple announced a new generation of hardware devices, including the highly-anticipated fifth-generation iPad–now called the iPad Air. While the launch highlighted a brand new device and a laundry list of new features, something that largely went underreported in the tech press was Apple’s decision to launch the new iPad Air in China for the first time ever. This comes months after the iPhone 5S and 5C became the first iPhones to launch in China. Ahead of September’s iPhone launch, Apple also held its very first media event intended specifically for Chinese journalists. Each of these represents a consumer-driven strategy, largely separate from its manufacturing operations in China. This was not the only noteworthy event that happened this week; Apple CEO Tim Cook was also reported to have joined the advisory board of Tsinghua University’s School of Economics and Management. Cook, who succeeded legendary innovator Steve Jobs as Apple’s CEO, has repeatedly said that Apple’s future depends on China; he has gone as far as to say that China is Apple's “most important market.” For a born-and-bred Silicon Valley firm headquartered in California, its focus on China is remarkable. Not only does Apple love China, but China loves Apple too–with a few caveats. Although Apple products see frenzied demand all over the world, China seems to be particularly remarkable in this regard as evident by the prolonged shortages of the iPhone 4S the country witnessed in 2012. Similar shortages were seen with the iPhone 5S and 5C this year. The relationship is not an “all-weather” one yet–earlier this year China’s state-run media launched an extended and seemingly coordinated indictment of Apple’s treatment of Chinese consumers, focused primarily on Apple’s warranty practices. In response, Tim Cook issued a public apology letter, which was met with ambivalence in China. Apple is not known to apologize lightly–the only other significant recent apology Apple has issued was its acknowledgement of its sub-par Maps application in iOS 6. Part of Apple’s strategy in China is likely driven by the fact that sales of mobile devices with cellular-connectivity (iPhones and iPads) are now the majority of its revenue. China is already the largest market for smartphones and could easily become the largest tablet market in the world in the near future. China Mobile (CM) is the country’s largest telecom company and its 700 million subscribers in mainland China and Hong Kong is nearly double the entire U.S. population. The company recently became accessible to Apple products after it secured a government license to run the iPhone. External factors have influenced Apple’s strategy in China as well. While Google may have withdrawn its web services from China, its popular Android operating system reigns supreme in the Chinese smartphone market. As The Diplomat reported earlier this year, the vast majority of devices being purchased by Chinese consumers run Android. As of the end of 2012, there were 160 million Android users to only 85 million iOS users in China. Competitive pressures are certainly driving the company further into the Chinese consumer market. Ultimately, Apple, like the U.S. itself, has launched a “pivot”–not to Asia in its entirety, but to China. Hardware firms have been content to exploit China’s low cost of labor and favorable manufacturing environment, but the real prize lies in tapping into China’s ever-increasing consumer market. 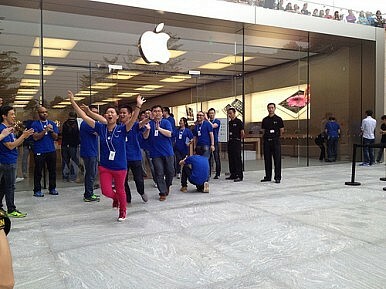 Apple recognizes this, and is determined to seize the Chinese market. Mobile App Developers in India Are Always Fighting Losing BattlesMaturing Myanmar: Is Business Still Confident?A Look at Android LiOS 7 vs Android: Smartphone OS ShowdownCan Amazon Find Success in China?